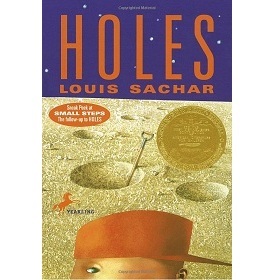 Holes is a book in the Children genre written by Louis Sachar. The book was published by Dell Yearling on 2000-05-09 and contains 272 pages. The book has an ISBN number of 978-0440414803. Our users found the overall impression of this book to be Exciting. The book Holes, by Louis Sachar, is a classic work of Children’s Literature. Using the quirky humor and colorful characters that make his books beloved amongst kids, the author weaves a tale full of prejudice, loyalty, and unlikely coincidence sparked by fate. He tailors his book for young audiences by writing in a style that appeals to children, using suspense effectively, and embedding strong, universal messages. Holes is an inventive and humorous book that is enjoyable for all children, whether hesitant or avid readers. The book is written in a style that appeals to children. The main character narrates the story with a transparent and honest voice that directly engages kids’ innocent nature. It also uses humor and irony to draw kids in. This is seen in the very first sentence, “There is no lake at Camp Green Lake.”(Sachar 3). Which demonstrates the kind of situational irony that is seen continuously throughout the book. What’s more, the author uses characters that children can relate to. The main character starts off having little self-confidence, but slowly learns to believe in himself. This makes him a very relatable character as many kids have a low self-esteem. Overall, the author doesn’t talk down to kids, or preach morals. Any messages that come through are subtle, and children appreciate that. The author uses suspense effectively throughout the plot. For instance, the book is written in third person through the limited point of view of the main character. This keeps the reader just as uninformed as he is. He also includes a lot of foreshadowing that clues the reader in to important events and keeps them guessing. Throughout the book the reader is slowly given small pieces of information, but is always one step behind, thus creating a suspenseful storyline. The book contains strong messages that endure the test of time. Take, for example, the gradual transformation of the main character. As he learns to assert himself and follow his conscience he becomes stronger emotionally. This gives kids a message that standing up for oneself and doing what’s right makes one emotionally secure. There are also underlying themes of loyalty, misguided prejudice, and good ultimately prevailing over evil. They are messages that can stand the test of time, because of their universal implication. Another strong message is the hopeful, optimistic tone that permeates the story. All of these messages inspire the reader even after they have finished the book. To conclude, Holes is a book that any child will enjoy. The author writes it in an appealing style for kids, uses suspense effectively, and embeds the story with strong messages. It should be a part of every kids’ childhood.